Violinists’ birthdays in January include Iwabuchi Ryûtarô 岩淵龍太郎(b. 1928) on 21/I, Shimizu Takashi 清水高師(b. 1953) on 13/I, Shinozaki Fuminori 篠崎史紀 (b. 1963) on 18/1,Suwa Nejiko 諏訪根自子(1920-2012) on 23/1 and Shôji Sayaka 庄司 紗矢香(b. 1983) on 30/I. Iwabuchi Ryûtarô and Suwa Nejiko were among the first “home grown” violinists of Japan. Both began to learn the violin already as children at a time when this had only begun to be the norm. Both performed from an early age and continued their careers after the Second World War. Iwabuchi won second prize in the NHK/Mainichi Music Competition in 1939 and in 1940, he and the winner of the first prize, Etô Toshiya (1927-2008), performed Bach’s Double Concerto with the New Symphony Orchestra (the predecessor of the NHK Symphony Orchestra in 1940: a repeat performance was broadcast in 1940. Iwabuchi became concertmaster of that orchestra in 1951, Japan’s youngest at the time. Later, he devoted himself to chamber music. In 1936 she left Japan, however, and studied first in Belgium with Émile Chaumont (1878-1942) and then in Paris with Boris Kamensky (1870-1949). She refused to leave Paris even when it was occupied by the Germans. In fact, thanks to the war and the diplomatic relations between Japan and Nazi Germany, Suwa may well be said to be the first Japanese violinist to enjoy significant success abroad. She became a protégé of the ambassador in Berlin, Ôshima Hiroshi. Her Berlin debut took place in December 1942. A lengthy column in the weekly Magazine Die Woche praised the “Violinist from the Land of the Cherry Blossoms” for having “penetrated so deeply into the spirit of German music that she can play Bruch’s famous Violin Concerto, César Franck and even Johann Sebastian Bach.” She played many concerts after her debut, and the collection of photographs in the archives of the Pallas CEGESOMA archives in Brussels (here and here) suggests that the pretty young woman also provided good copy for magazines – or would have done, if the war had not caused them to shrink and disappear. Most spectacularly, she was honoured by Propaganda Minister Joseph Goebbels on 22 February 1943 for playing for wounded German soldiers. Goebbels allegedly presented with a Stradivarius, which has since been the object of much speculation. 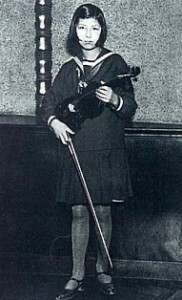 Suwa, with her new Stradivarius (if it really was one), played the Brahms Violin Concerto with the Berlin Philharmonic under Hans Knappertsbusch on 19 October 1943, to acclaim (Photo n° 207824). By then newspapers had dwindled to a few pages, but the Berliner Lokal-Anzeiger praised the performance by the Japanese “Geigenwunder” (violin miracle) highly. At the end of the war, Suwa was taken to the USA. by the U.S. army and repatriated at the end of 1945. In the years immediately after the war, before foreign artists returned to Japan in great numbers, she played many concerts all over the country. But in the 1960s she became mysteriously silent. She returned to Germany in 1969 as the wife of Ôga Koshirô, the first president of the Japanese Cultural Institute in Cologne but never performed publicly. Asked by a Japanese fellow-violinist about her Strad she merely gave an enigmatic smile. In the early 1980s she celebrated a brief comeback when she made a few recordings, then she sank into oblivion once again. Her death on 6 March 2012 went unnoticed and the Asahi newspaper only published a brief obituary six months later, presumably in response to Carla Shapreau’s article in the New York Times on 25 September 2012. Thus an aura of mystery surrounds Suwa Nejiko. I cannot help feeling that the years 1942 to 1944, when the photogenic young woman hobnobbed with Japanese diplomats and celebrities, when the brilliant violinist toured Germany, braving railways and cities increasingly ravaged by bombs, must have been the most exhilarating year of her life. There are several recordings of the young prodigy on Youtube. 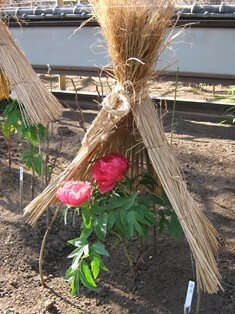 The one here is of a Japanese song 美しき天然 (The beauties of nature). The melody, composed around 1900, is said to have been the first song in waltz rhythm composed by a Japanese. Read more about Suwa Nejiko and the other violinist mentioned in this blog in Not by Love Alone.